What’s the difference between liquor and liqueur? Should I be ordering my drink neat, up or on the rocks? And what about a martini—shaken or stirred? What the heck are bitters and botanicals? If you’ve asked yourself these questions, you’re not alone. At The Cork, you can pose these questions to skilled bartenders who are more than happy to teach you about their craft. At home may be a different story. 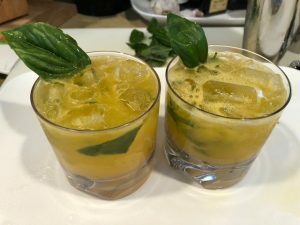 Maybe you’ve recently been gifted a cocktail cookbook or want to try an interesting drink recipe you saw on Pinterest, but you’re worried about purchasing the ingredients and then messing up the recipe. That’s why the best way to start crafting your own cocktails at home is to start with drink recipes you know are good. So take it from us and try two of Chef Jim’s favorite cocktails this season. Many of the ingredients can be found at your local farmer’s market, with the rest consisting of staples in your liquor cabinet. With a few simple ingredients, you can easily create a unique and refreshing cocktail! A fresh twist on your favorite accompaniment to brunch! In four simple steps, you can have your own Bloody Mary—no mix needed—at home.